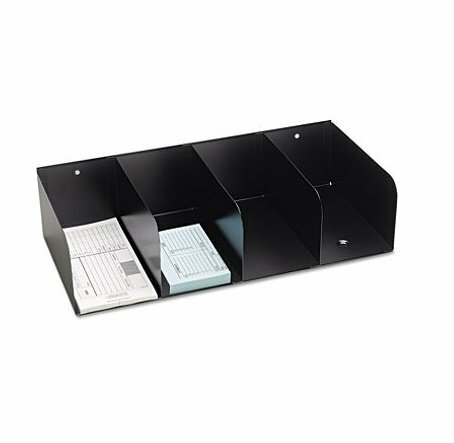 Save space and prevent counter confusion with this 10-pocket vertical rack. Keep receipts, cash tickets, money orders, debit slips, envelopes, notes and so much more all at your fingertips. Rack offers a one-piece, all-steel heavy-duty construction and rubber feet for quiet, nonmar, nonslip operation. Ensure your business maintains better books with a Check Cover than holds checks and stubs! Staying organized, especially when it comes to your finances, is essential to your long-term success. 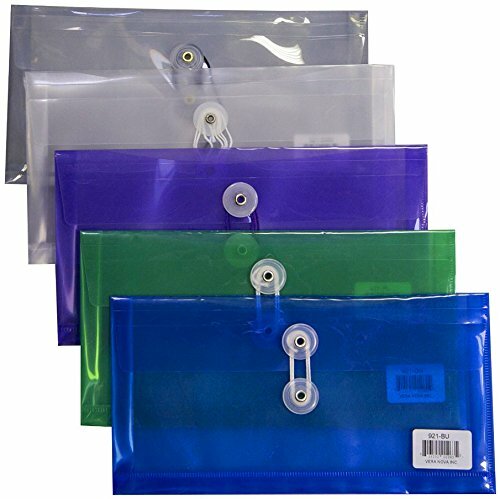 And when you want to keep everything in order and reduce stress, especially when you deal with business or personal checks, it's important to have a binder that fits your specific needs. Introducing the Abc Check Binder For End-Stub Deskbook designed to help your business checks stay organized so you can continue to grow, flourish and reach your investor and customer goals. It doesn't matter if you're an entrepreneur working out of your home or a growing brick-and-mortar store managing a regular checks-based system, staying organized can help you make better, more informed and more consistent decisions for yourself and the future of your business. And with our premium Check Cover, you'll find that keeps everything in order is far easier when it's all at your fingertips. Deskbook Check Cover Binder Construction matches the End-Stub style of deskbook. cover is made of durable vinyl for go-anywhere protection. 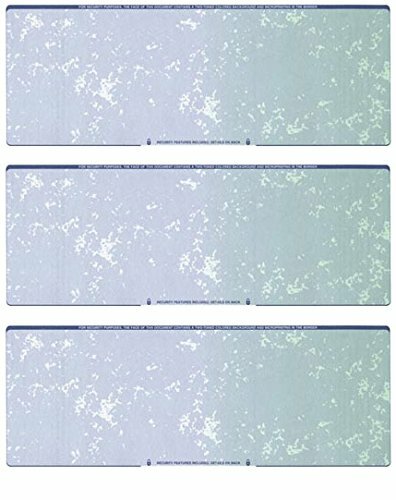 Size: 11 1/4 x 9"
Binder For End-Stub Deskbook Checks (With Side-Tear Vouchers). 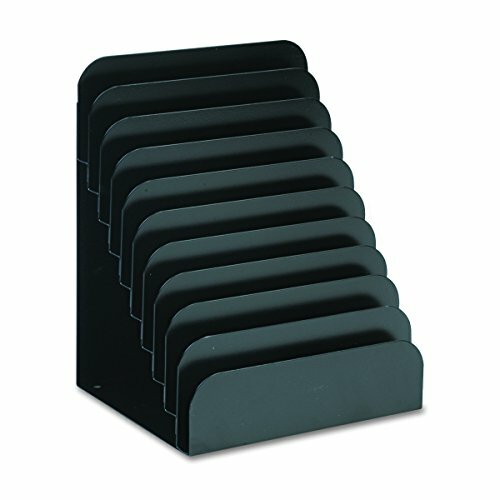 Compatible with compact End-Stub Deskbook (Item 56300N). MMF Industries is a world-class supplier of security, cash handling and metal storage products. 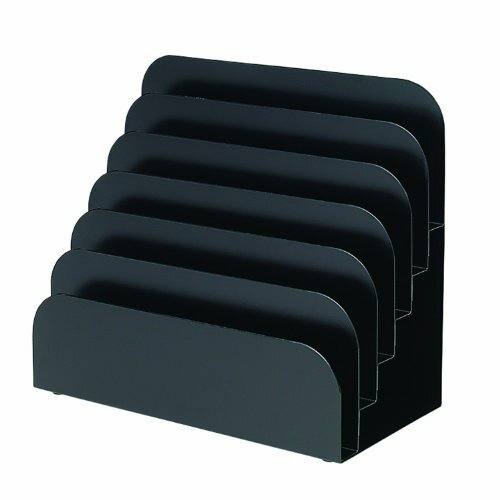 These MMF Industries Steel Cashier Pad Racks are designed to maximize desk space. 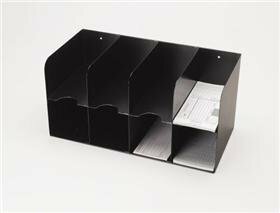 The tiered, steel rack allows storage of commonly used forms including order forms, applications, deposit slips, and tax forms. 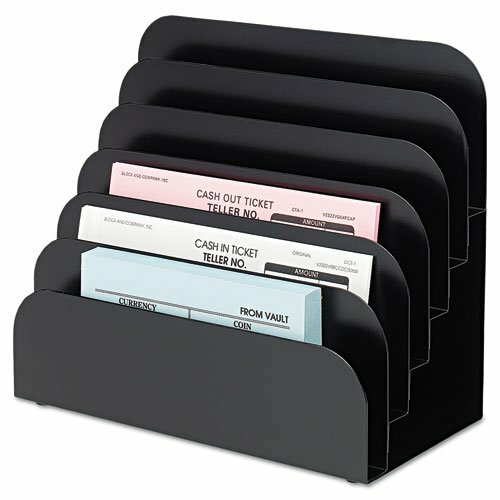 Featuring six 8 inch wide pockets, the ascending display makes viewing and retrieval of forms quick and easy. The rack has a non-mar, non-slip bottom - for a scratch-free, secure grip and is available in this 6-pocket model. 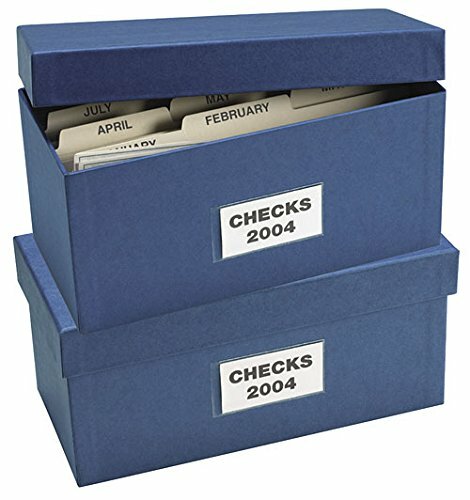 Our Check Storage boxes make tax time easier than ever. Area on outside to label contents and account information. Great for business or personal checks. Keep all your checks, money orders, clearings and deposit sheets stacked neatly and conveniently in one place. Ideal for use at banks, currency exchanges, and check - cashing businesses. These check separators set up as check centers for rapid separation and stacking of checks, money orders, clearings and deposit sheets. Can be used on countertops or hung on walls, two mounting holes provided to maximize counter space. Constructed of electrically - welded durable heavy - gauge steel with scratch and chip - resistant black - stain finish that stands up to everyday use. Number of Pockets 8 - pocket, measure 4inW x 4inH x 8inD each. Type double -tier check separator. Color- black, other items are not included. 12.125W x 7.875H x 8D in. Ideal for use at banks, currency exchanges, and check - cashing businesses. Can be used on countertops or hung on walls, two mounting holes provided to maximize counter space. 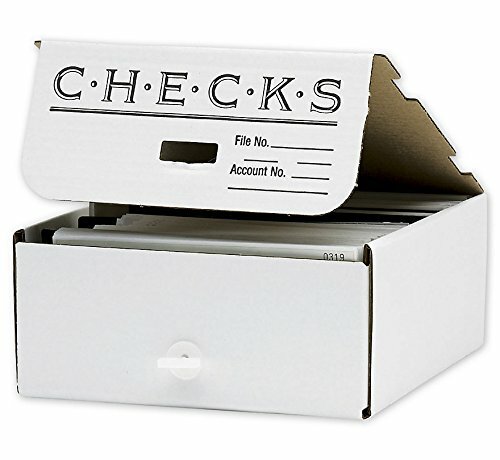 TechChecks business check storage box is the perfect way to safely store your canceled or postdated checks. This check storage box contains an adjustable follower inside to keep your contents upright. It includes 12 dividers, one for each month, it will hold approximately 700 checks in total. Chipboard construction makes stacking easier. 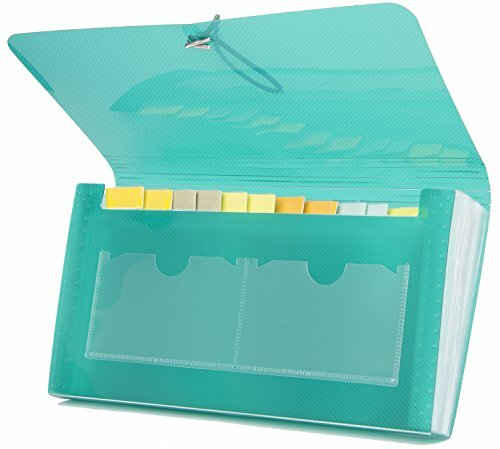 Includes 12 individual dividers that can be used to divide each months checks and has a clear outside label to identify contents. Lid is not attached, it lifts off. Will hold approximately 700 checks in total. Brand: Tech Checks | Manufacturer: Tech Checks Inc.
MMF Industries single-tier counter check separator is ideal for tellers separating and storing checks, money orders, clearings and deposit slips. Display the separator on a desk or counte, or use the eyelet to hang it to maximize counter space. Durable, heavy-gauge steel is coated with a scratch-resistant, chip-resistant finish to stand up to everyday use. Each pocket measures 4" wide x 8" deep x 4" high. MMF Industries offers customers a full array of reliable office and banking products that keep customers coming back. 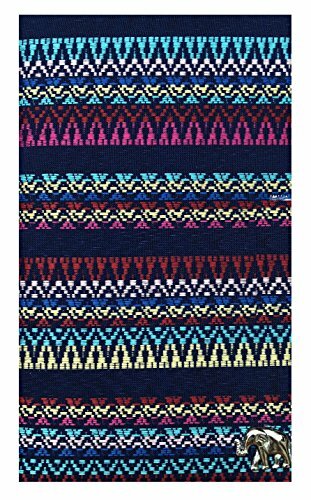 Sheet Size: 8 1/2(w) x 11(l) Check Size: 8 1/2(w) x 3 1/2(l). 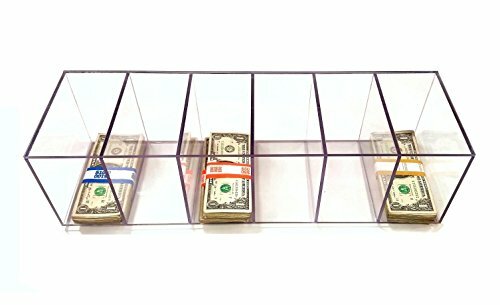 6 compartment clear currency Sorter for separating and organizing cash, tickets or cash. Compartments are 3 1/4 inch wide and 6 1/4 deep. Dividers are 3/16 inch PETG for added strength. Overall size: 20 3/4 W x 5 3/4 H x 6 1/2 D made from 3/16 inch PETG acrylic. A sleek look with a secure design, the Storex Locking Check Box is a necessity for any home or office needing to file any sort of check. The dimensions of the drawer allow it to fit any size check. The boxes, each with a unique lock and key, may be stacked up to 12 units high (each sold separately) and includes vertical connectors to ensure stable stacking for multiple drawer installations. The box is made of sturdy moisture-resistant polypropylene in a black and grey color. Its extra depth allows for plenty of secure storage, and the label holder allows for easy view organization. The sturdy handle allows you to easily open the drawer for quick access to checks or other small documents. These drawers are made from a minimum of 25% post-consumer recycled materials, so you are getting a more sustainable product. Storex is committed to provide a stylish quality product. Storex office supplies have always been and will always be 100% PVC-free. Storex - Built to function, designed to impress. CGOLDENWALL is a manufacturer specialized in electric centrifuge, we will provide to you the English Instruction and Professional Service. If you get it from others , you may not get our professional service.Any question,our team will give you Professional after-service. 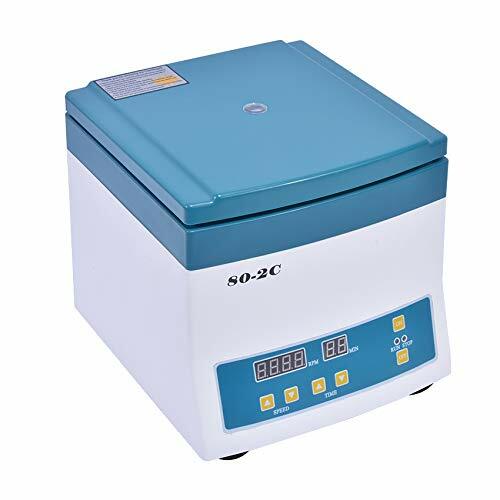 It is controlled by microcomputer and electronic timing speed centrifugation time , speed automatic stabilizers , timed precisely . Motor brushless DC motor, long life, maintenance-free. The shell is made of high quality PVC plastic, looks beautiful, economical and practical, widely used in biological, chemical , pharmaceutical and other research and education with the productive sector , and its maximum speed of 4000 rev / min for the identification and separation of radioimmunoassay and large particles , such as cells . Smart digital electric centrifuge speed by a centrifugal force generated by rotation , so that the liquid in the test tube was produced in the precipitate is separated by the centrifugal force according to the particle size and quality of the test purposes . 1. With balance protection device. 2. Digital display speed and run time. 3. Equipped with a safety switch and mechanical locks. 4. Touch panel control , easy to operate. 5. Maintenance-free brush-less motor , microcomputer control. Supported currencies: Canadian dollar, Taiwan dollar, Japanese yen, Korean won, Thai baht, ruble, Australian dollar, Hong Kong dollar, dollar, RMB, pound sterling, euro, others. --Portable handle, easy to carry. Battery power supply, no need ac power, day and night available. --Identify paper money, currency, passport, bank drafts, checks, credit cards, VAT invoices, petrol tickets, customs taxes, etc. --Supported various currencies, Canadian dollar, Taiwan dollar, Japanese yen, Korean won, Thai baht, ruble, Australian dollar, Hong Kong dollar, dollar, RMB, pound sterling, euro, others. 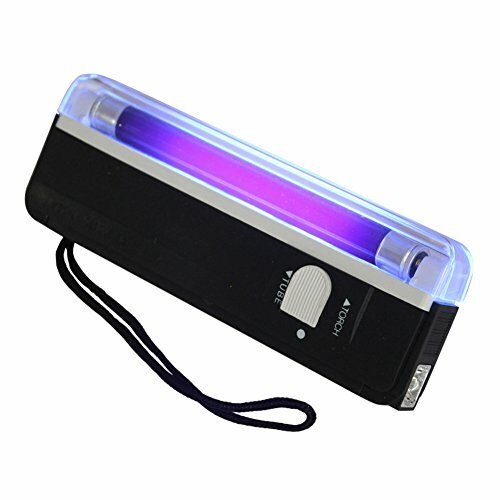 --Push the switch to TORCH for flashlight, and to TUBE for ultraviolet check. 1.The delivery time usually take 10~20 days or less. Please ignore Amazon's. 2.Any question, please contact us first but put a feedback. We will reply you in 24h. You will suffer no loss. We appreciate your positive feedback. Please do not leave negative feedback or A-to-Z claim without asking us for help. Our goal is to provide top-level customer service, we will never make you suffer any loss within a reasonable rang. Womens tuxedo pants taupe pants womens cuffed pants womens womens wide leg pants wide pants women army pants womens womens capri pants skinny pants womens low rise pants womens suspender pants womens dress pants high waisted dress pants flare dress pants burgundy dress pants pink dress pants casual dress pants maroon dress pants blue dress pants long dress pants misses dress pants cropped dress pants printed dress pants. Slacks pants for ladies ladies hot pants cotton short pants for ladies short jeans pants ladies office pants for ladies long denim shorts ladies ladies pull on denim shorts ladies denim shorts ladies denim cargo shorts ladies red denim shorts skinny leg dress pants ankle pants for work white ski pants skinny work pants long black pants womens shorts shorts for women dress shorts womens women in short shorts tan shorts womens. Womens crop pants comfortable pants for women orange pants womens maroon pants womens brown pants women office pants womens beige pants womens jogger pants women cream pants womens chambray pants womens camel pants womens parachute pants womens womens knit pants straight leg pants womens lightweight pants womens high rise pants womens purple pants womens pleated pants womens gold pants womens women and pants womens formal pants outfits. 2 in 1 combo creative stationery marker pen. Can be written on white paper, clothes, etc. The words written are invisible, but it can be seen under the lights. Also suitable for as a gift to children.